Victoria Azarenka hits a shot at the French Open on Monday. 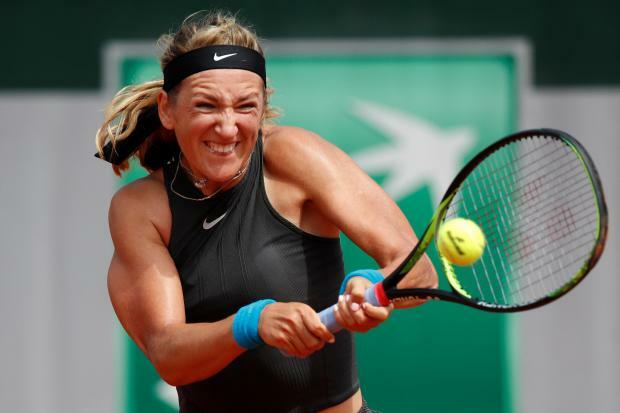 Two-time Grand Slam winner Victoria Azarenka crashed out of the French Open in the first round losing 5-7 5-7 to Katerina Siniakova on Monday, playing only her fifth tournament of the year after a legal battle over the custody of her son. The Belarusian returned to tennis in June last year following the birth of her son in 2016 but then put her career on hold again as she fought a legal battle against her former partner. A judge in California had ruled that her son Leo should not leave the state until custody was resolved. After losing the first set, Azarenka showed signs of a comeback, winning a fierce-hitting baseline exchange to go to 2-2. But she was unable to build momentum even as her Czech opponent lost her cool over a handful of disputed line calls. Former world number one Azarenka has endured a tough return to Europe's clay courts, losing in the second round at the Madrid Open before being dumped out of the first round in Rome. She is currently ranked 84 in the world. The months-long custody fight over her son Leo has been a painful distraction for Azarenka, and the 28-year-old said she had been looking forward to her return to Paris. "Ah Paris, we love each other, no?," She tweeted earlier this month. In an open letter posted on social media last year, Azarenka said no one should ever have to decide between a child and their career. Azarenka won the Australian Open in 2012 and 2013. Her best performance at Roland Garros was in 2013 when she lost in the semi-finals to Russia's Maria Sharapova. She has said she will play at Wimbledon this year.